Back to the fancy stuff for now. Until I can get someplace with a real internet connection (AT&T DSL… is less than ideal. ), I thought I’d show some stuff from the archives. On the way to Woodworking in America in 2011, I visited the Speed Museum Louisville, KY. I had never been to Louisville, it wasn’t that far out-of-the-way and I heard good things about the museum. There wasn’t that much furniture in the main portion of the museum but there was a special exhibit of Kentucky Furniture from the Noe Collection. Recent acquisitions I expect. I have come to appreciate Kentucky and Tennessee furniture. Not as fancy as Boston, Philadelphia or New York but still interesting. More flat than turned. Clean simple lines with just a bit tasteful ornamentation. Click to see the full set from the Speed Museum. I will let the furniture speak for itself. Not much I can add. The Speed Museum is closed for a major expansion through 2015. I’ll be there when it reopens. Nailed and boarded furniture seems to be all the rage. Adam Cherubini and Chris Schwarz have been writing about it for a while now at Popular Woodworking. 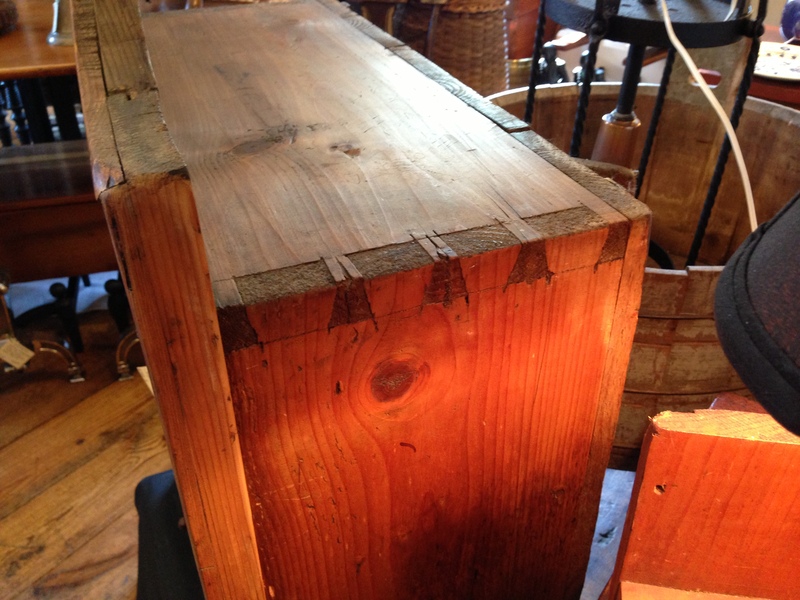 Mike Dunbar did an construction article about a boarded chest for Fine Woodworking back in 2009. Tommy MacDonald just did a six board chest for Rough Cut. (Why he put those ugly/inappropriate gate handles on the ends I don’t know.) 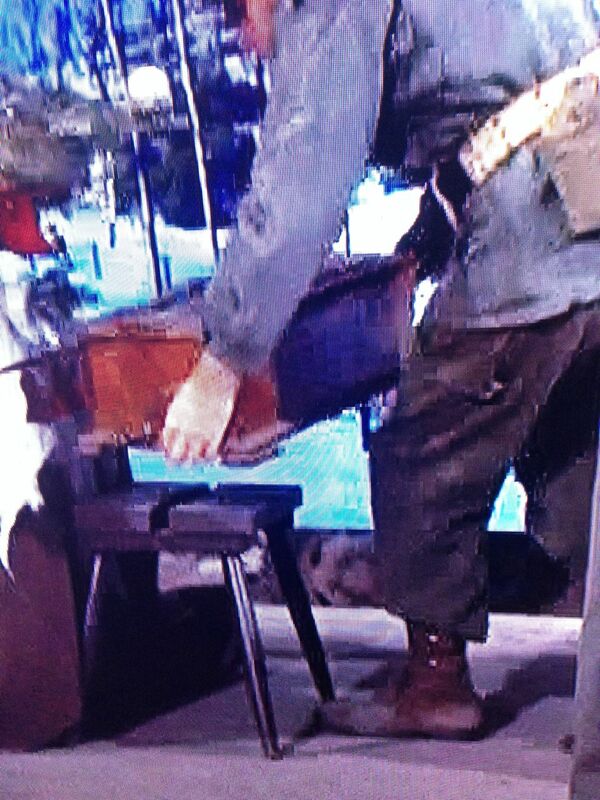 And today I just watched Don and the boys on the Woodsmith show build a rustic step-back cupboard. Everybody uses cut nails. Tommy Mac actually did one of his famous road trips to the Tremont Nail Company. What a guy! I got a request for pictures of some other than dovetailed furniture and today I comply. I have a set here of six board chests, cupboards, jelly and pie safes, and mule chests. Above is a cupboard from South America. I can’t tell if it is a repair to the bottom or an attempt to raise it. I am particularly fond of wooden pintle hinges. 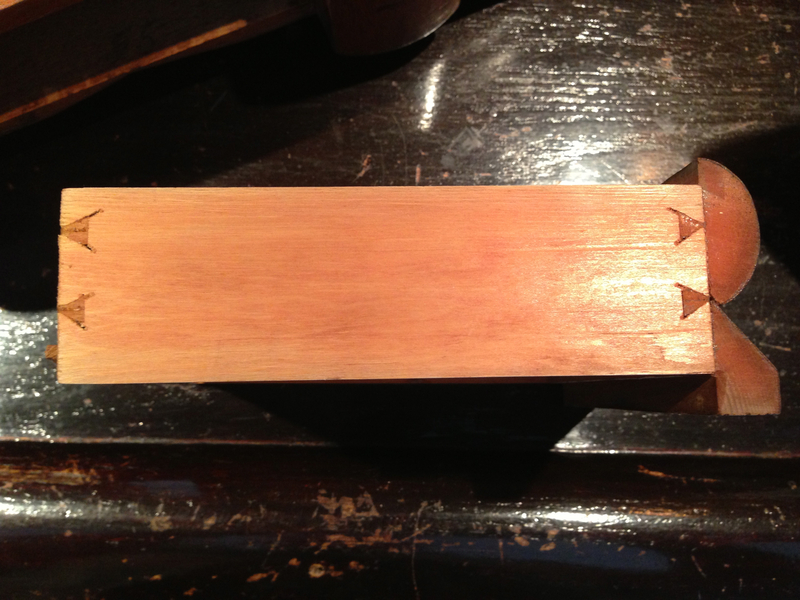 I used this style hinge for a chest I built at the Woodwright’s School a few months back. 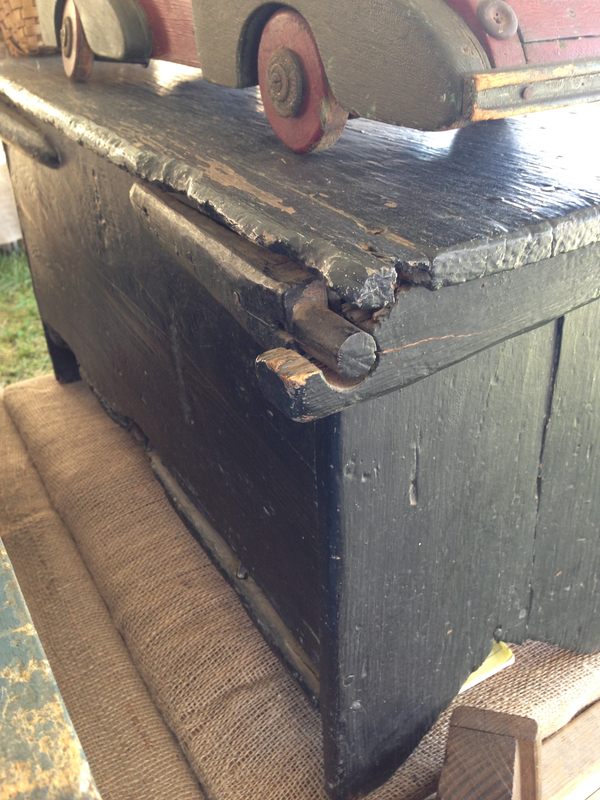 Below is a set with detailed pictures of a mule chest I reproduced. I had to build my own because after three years of admiring it, someone else went and bought it. I guess it wasn’t a museum after all. Pie safes are coming soon. Lots of different tins. In the recent past there was an article in Popular Woodworking on the construction of the Moravian stool. Jim Campbell, the founder of the Hillsborough Orange Woodworkers, decided it would be an interesting project for our Monday night work sessions. My function was largely to supply a heated/air-conditioned shop (with bathroom) and to stand there and looked horrified at all the people using power tools, usually my power tools. And we built a bunch. A few months later I was researching the Moravian chair, a Moravian stool with a back. (Little know fact, this is the only piece of furniture that can legally have a cut-out of a heart as part of the decoration.) 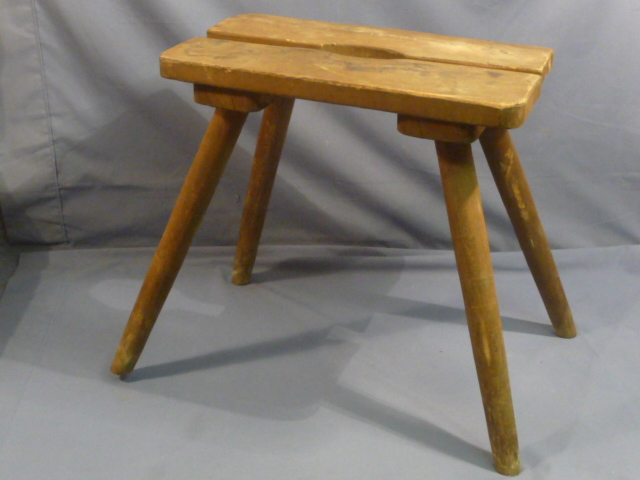 I came across a few articles pertaining to the German barracks stool, a knock-down variant of the Moravian stool. 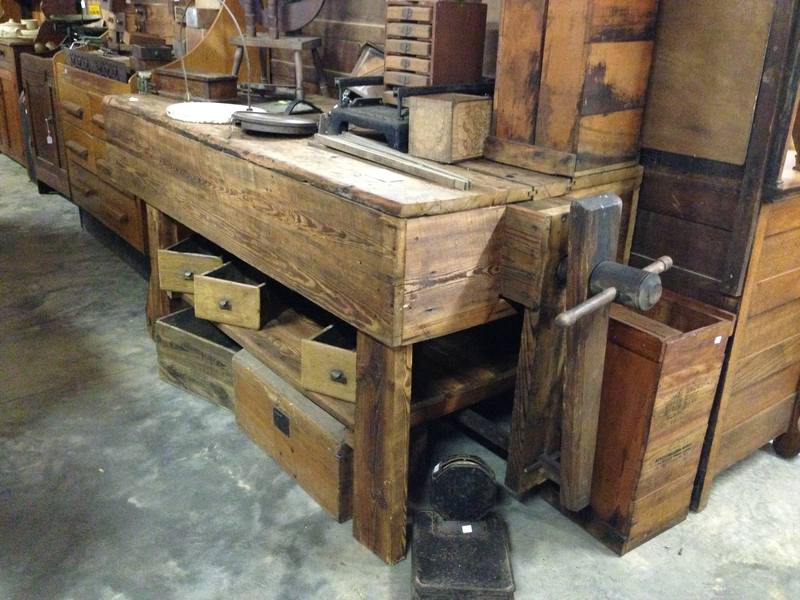 It typically has a two-piece seat supported by dovetailed battens, press in legs and pegged together. 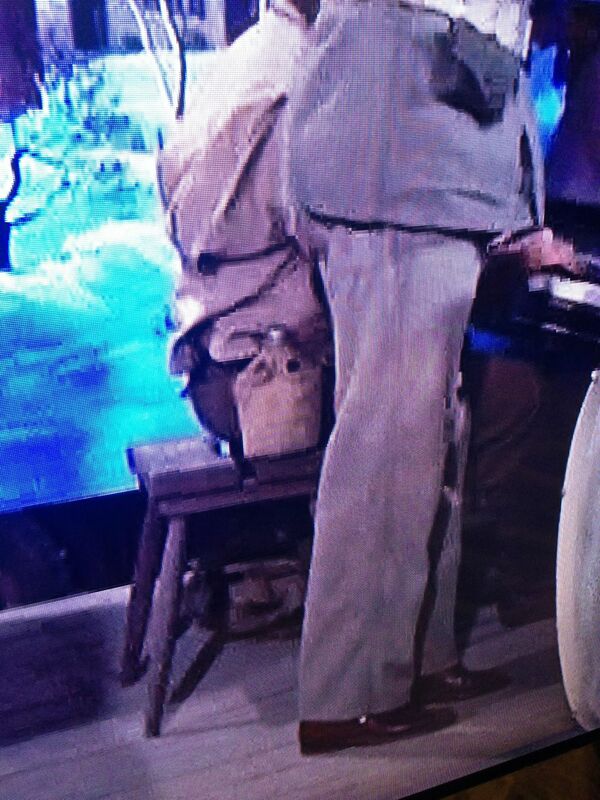 German barracks stool only nicer. And the pianist had one too. Third Hermitage I’ve been to this year. The first Hermitage I visited was Andrew Jackson’s mansion near Nashville, TN built 1819-1821. No pictures allowed. The second was an Arts & Crafts house built by William and Florence Sloane near Norfolk, VA in 1908. No pictures allowed. This post is about the one in St. Petersburg (Russian Federation). It is a series of buildings including the Winter Palace (the former state residence of the Russian emperors), the Small, Old (Great) and New Hermitages, the Hermitage Theatre and the Auxiliary House. The collection of the State Hermitage Museum includes more than three million works of art and artifacts of the world’s culture. And you’re allowed to take pictures! It was founded in 1764 by Catherine the Great and has been open to the public since 1852. It is a bit overwhelming. Italian, Spanish, French, Flemish and Dutch collections. Rumor has it there might be some Russian art in there, too. There was a fair amount of furniture but our guide was a woman with an agenda and a timetable to keep. I took what pictures I could and hope it’s enough. We started with Italian, moved on to French and then Spanish and lots more. I tried panoramic shots and was pleased with the results. Two unintentional videos at the end. I could remove them but they work. The last few pictures are some scenes from around St. Petersburg. If I were a better person, I would remember what they were. The whole set is a bit over the top but fascinating. Nothing but the best of the best. This one picture caught my eye. 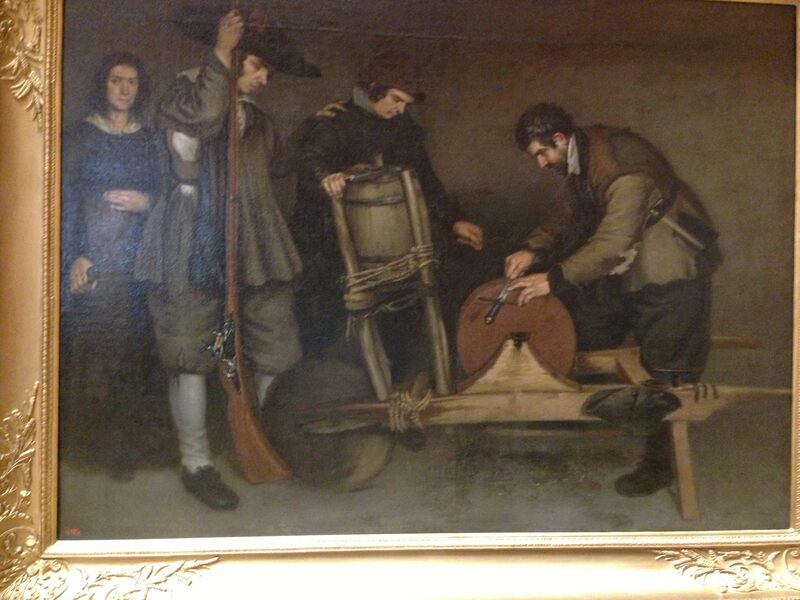 It’s purported to be from Carpintería Populares’s* first Woodworking in Spain in the 17th century. I believe it is a session on sharpening. Sharpening session. From left: David Charlesworth, Ron Herman, Frank Klausz and Christopher Schwarz. As a person who cares about words, I am annoyed by the easy use of the word “awesome” over the past few years. Overuse or misuse of a word diminishes its meaning. The Grand Canyon is awesome. A clearance sale at H & M, not awesome. 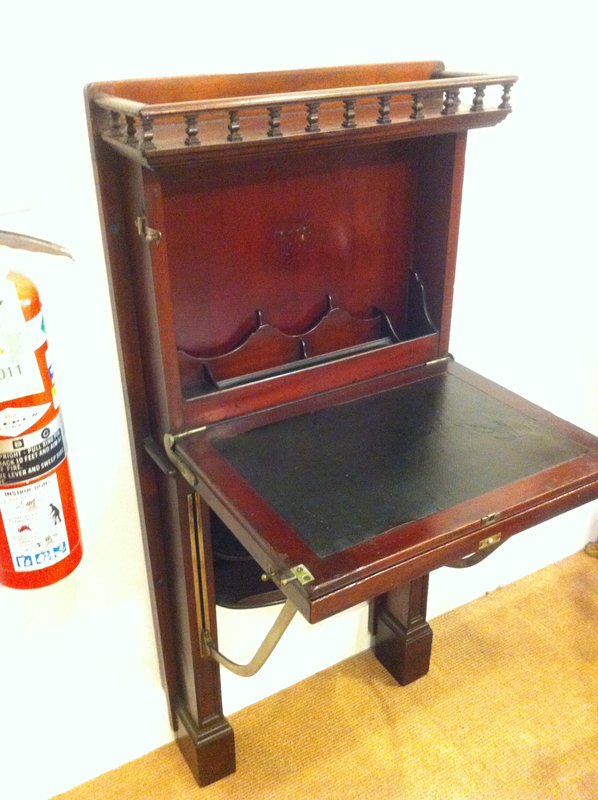 I saw a desk very much like this one at Woodlawn, a plantation located adjacent to George Washington’s Mt. Vernon near Alexandria, VA. The land had been part of Mt. Vernon and was given to Martha Washington’s granddaughter and her husband to keep them close. Woodlawn is now owned by the National Trust for Historic Preservation. Tours are given but pictures are not permitted. Back to the desk. The desk at Woodlawn was more “Colonial” in appearance and wheeled. 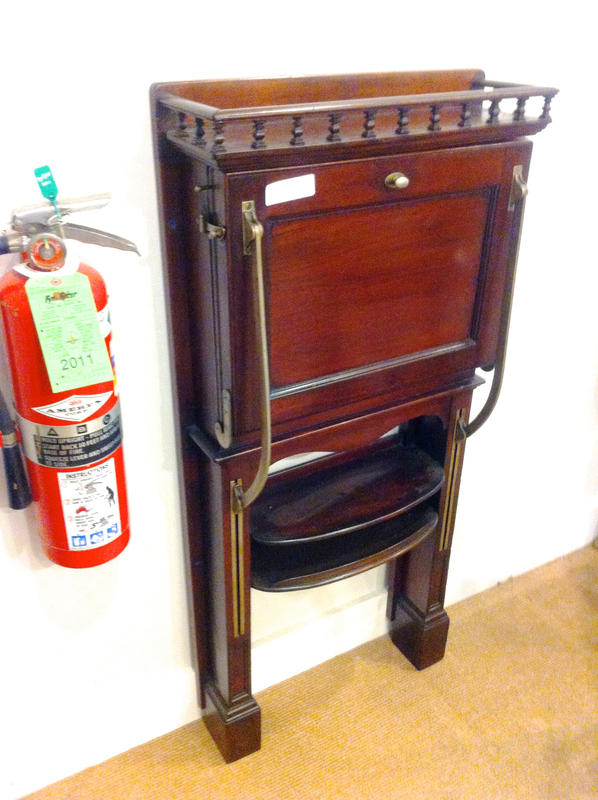 I had never seen anything like it until I saw this one in Las Vegas at an antiques mall. The one in Las Vegas looks much older in life than in the picture. I saw a similar desk in another place that prohibited photography. It remained a mystery for years until I was looking through a recently acquired copy of Southern Antiques and Folk Art by Robert Morton. 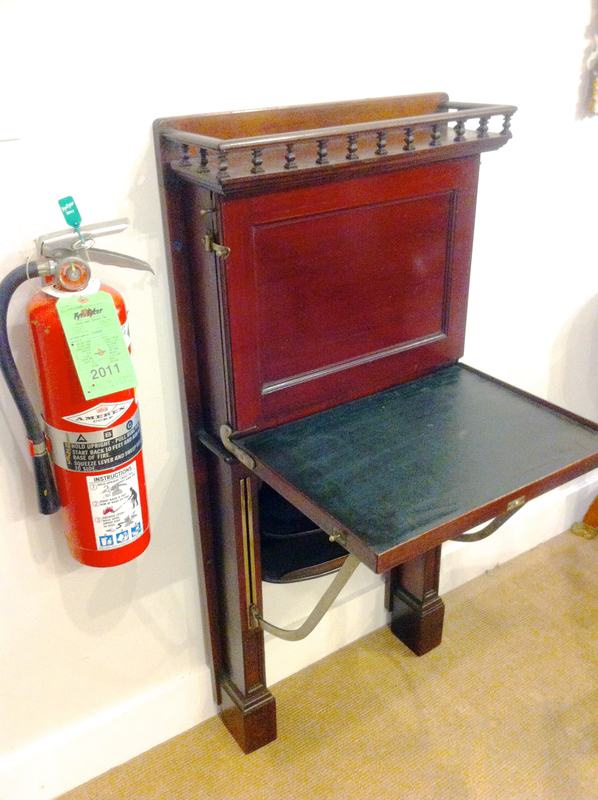 The caption of the photo on page 85 identifies it as a fire screen desk, called by others a fireplace screen desk or screen desk. The theory of the desk was that you could work in front of the fireplace and keep your feet warm while the desk blocks the direct heat from the fire on your face. 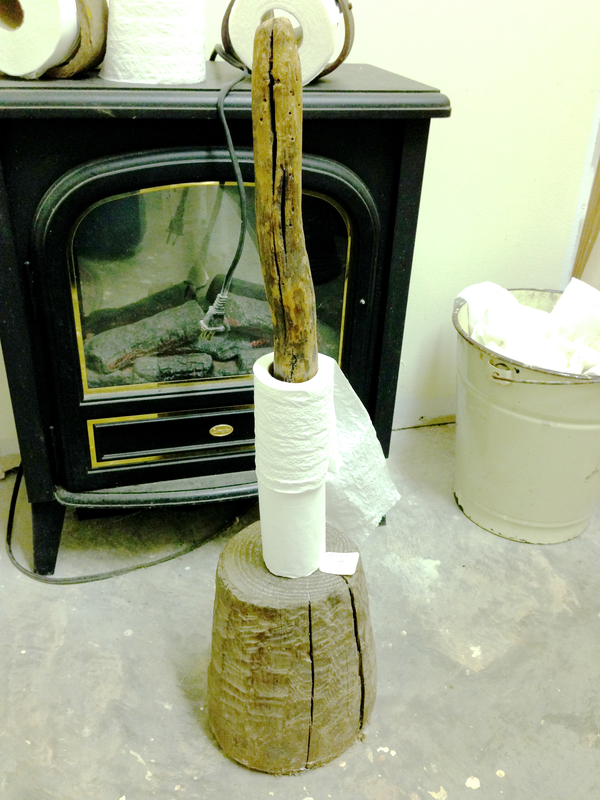 Joel’s Blog at Tools for Working Wood Too Many Projects!! I ran across a smaller desk at a local antiques shop. 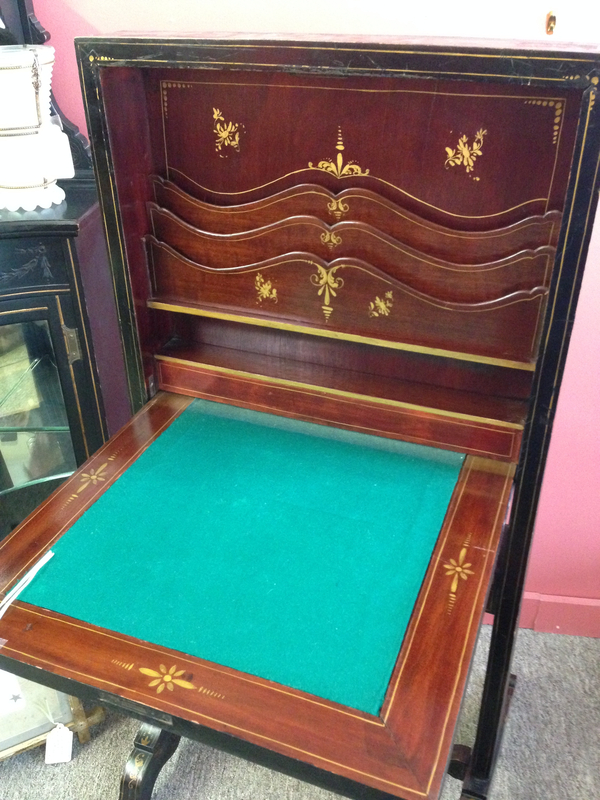 This form is called the “secretaire en portefeuille”. This translates as portfolio or wallet secretary. 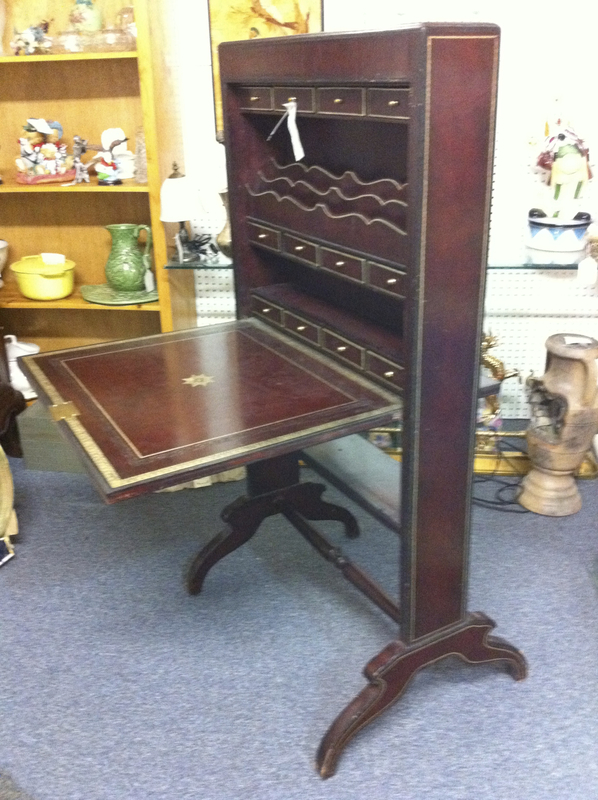 This one seems to be more of a lady’s desk. 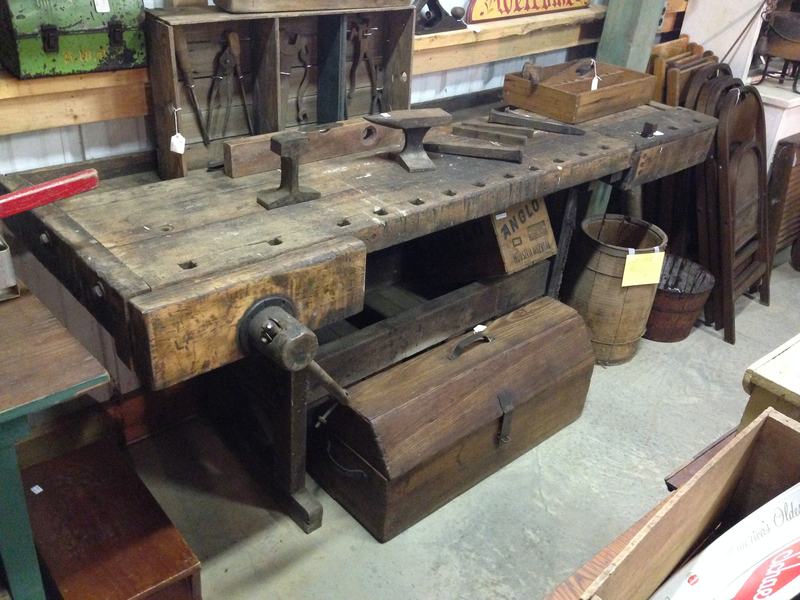 I saw this last desk at a dealer in Lambertville, NJ. This form is less effective at blocking flames but keeps many of the characteristics of the others. I just want to know where to get the hardware. Located with the Woodlawn plantation house is Frank Lloyd Wright’s Pope-Leighey House. Build in 1940, this is one of the more modest Usonia houses, built for the masses. A different experience but just as interesting. Christopher Schwarz first impressed me with his boyish good looks and easy way with the ladies. Then I came to admire his as a scholar, craftsman and educator. Now I am in awe of his discipline and work ethic. This blog stuff is hard and he does it every day. Sometimes twice. Topics aren’t hard. I have too many of them. Actually writing something coherent is non-trivial. First you have to get past the rather astounding notion that you can write something that another intelligent person would be willing to waste some of her/his dwindling life reading. A narcissistic act. Then there is spell check making you feel like the undereducated slob your teachers always knew you were (are). And the risk of disappointing a certain red-headed editor that I have come to accept as my spiritual mother in the task. Back on topic, squares. 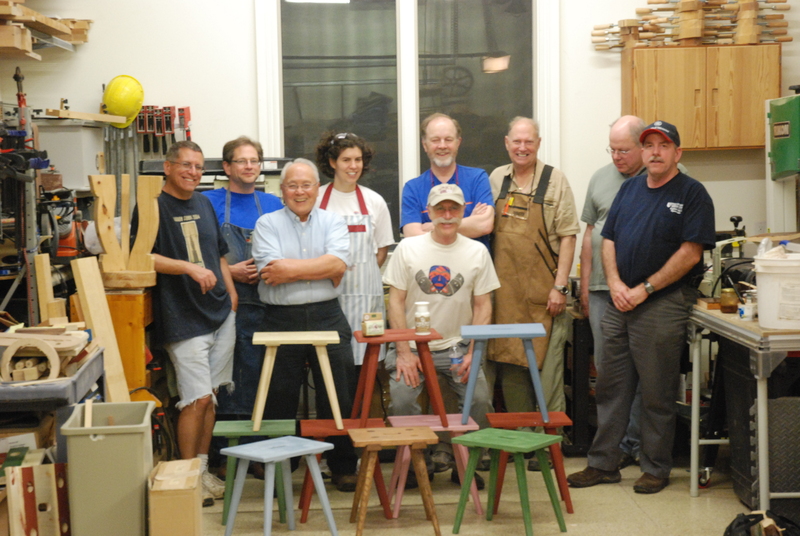 Earlier this year I saw the Master was teaching a class on layout tools Highland Woodworking in Atlanta. My wife was in California at school for a few month so I had no reason to spend the weekend at home. Lots of things going on Atlanta. I know of a few quality hotels in the area for under $60 per night so I went. During the class I made my third French layout square, the first being a factory second from Lost Art Press and the second being a genuine antique purchased at a MWTCA meet from Tony Murland. When I got home that night, I looked at my copy of The Tool Chest of Benjamin Seaton, 2nd Edition and saw this was the small square at 15″ by 12″. The middle sized square is 25″ by 20″ and the large one is 32″ by 20″. So I found some cherry and built them. From the left, try square from Atlanta, LAP factory second, small Seaton square, medium Seaton square and the large Seaton Square. That’s how I came to have three Seaton squares. Are the big squares useful? Everyone who kept borrowing mine at Chris’s boarded chest class at the Woodwright’s School thought so. 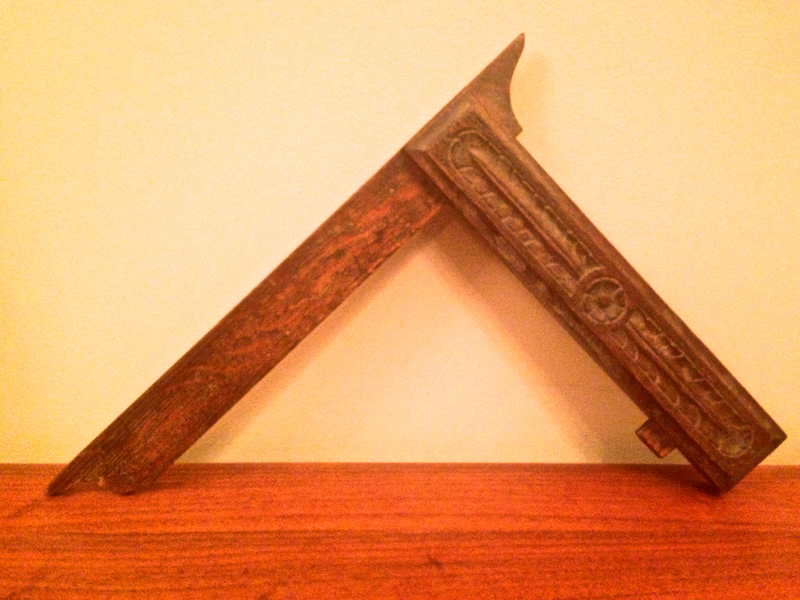 409 new dovetail pictures! Can you stand it? Just click away. Yes, there are yet more dovetail pictures. All new, relatively speaking. 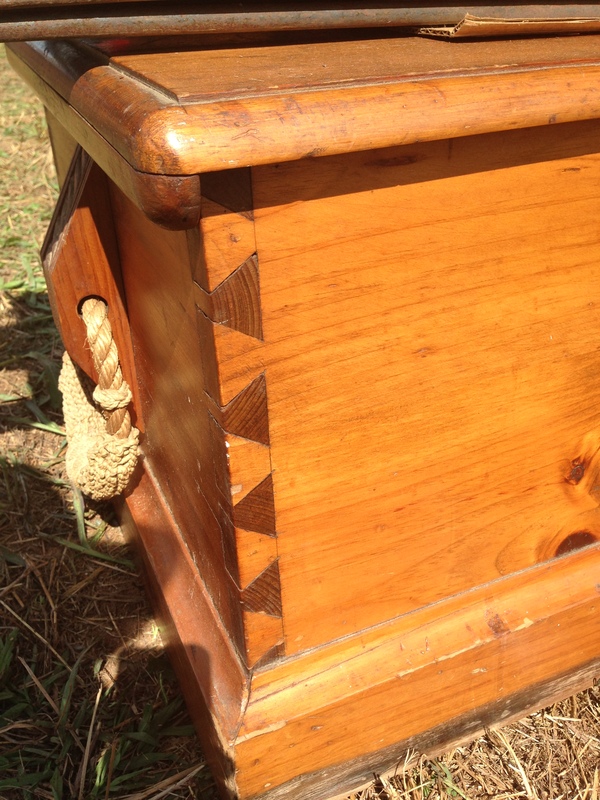 There are many smaller drawers that start with a half pin and end on a half tail. Start with a pin, end with a tail. 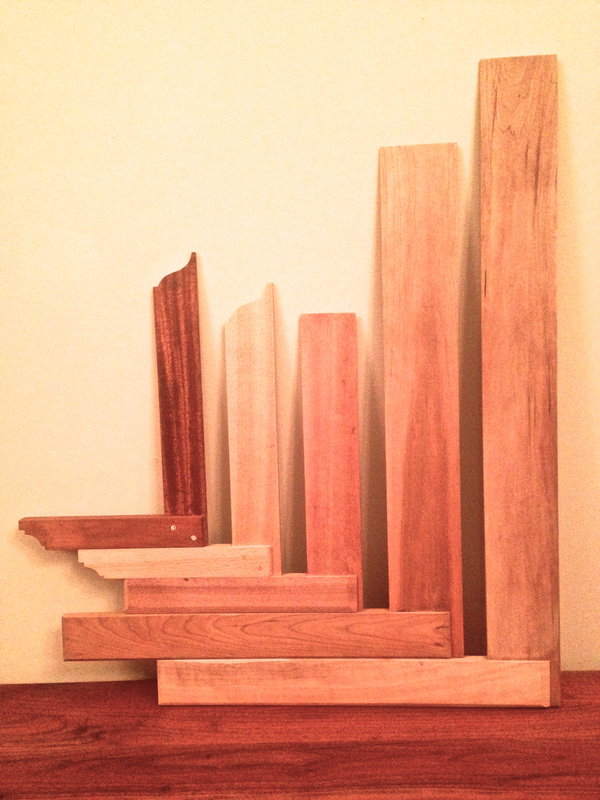 Several sets of bracket feet with dovetails. 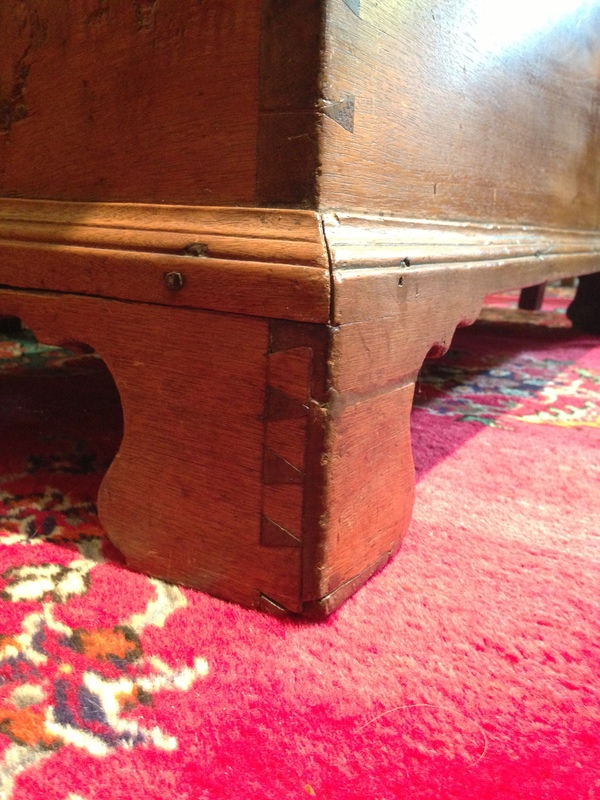 Bracket feet or plinth with dovetails. Click here to see all 409 pictures. I see a lot of antiques and I have no interest in owning many of them. Mostly because I can’t afford them, I don’t have room for them and I want to stay married. There are a few pieces that I think are interesting (and cheap) enough to add to the collection. When they are at an auction, I place an absentee bid and walk away. I don’t have the patience to sit through an auction and I fear I would get sucked into the bidding fervor and overpay. And sometimes I don’t win. Below are two such pieces. I was so confidant that I would take them home that I didn’t take enough pictures or measurements. Neither is that outstanding an example but both are things I haven’t seen before and was interested in replicating. Simple but challenging. The first is a serving tray with a drawer and lock. The tray is about 18″ by 12″ by 5″ high. I like the notion of a locked drawer on such a portable piece but I guess it does provide a very casual level of security. Click to see full Flickr set. The other piece was billed as a salt box. 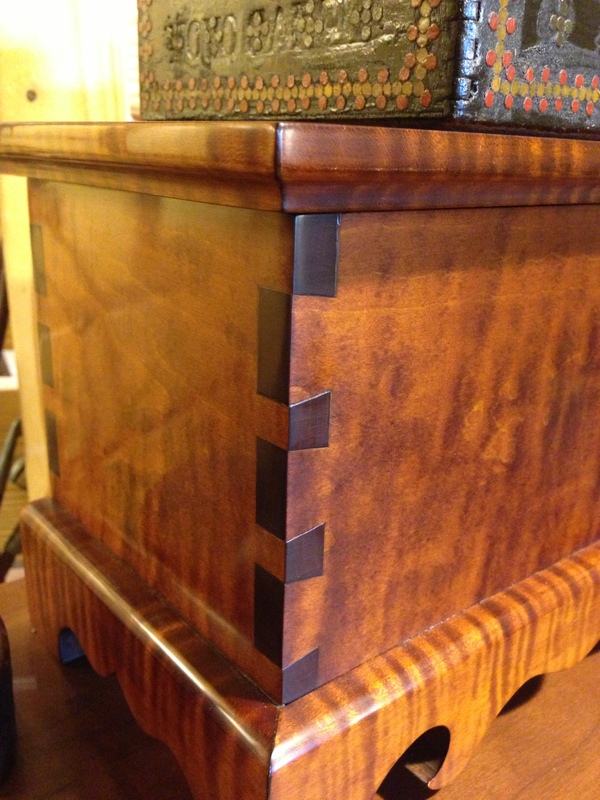 It is a wall hanging box with carcass dovetails, a dovetailed drawer, nailed on bottom and lid with integral hinge pins. Nice box and the first one like it I’ve seen. 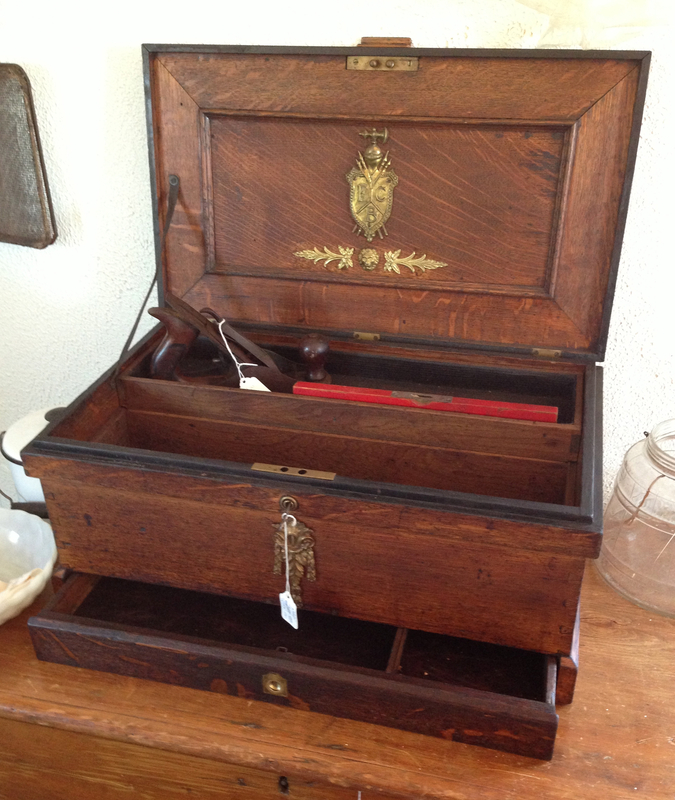 The previous post had a broken link for the full set of pictures of Pittsboro antiques. Click here to see the full set on Flickr..
A maul is a terrible thing to waste. The shame of a repurposed maul. Please, can you help? There is an antiques dealer near Pittsboro, NC that only opens the shop to retail customers occasionally. I have usually found out about these openings after the fact. I got lucky and made it into the shop. They have a good assortment of primitive and mid-level antiques, nothing too fancy. Very affordable. Many unique pieces that I had never seen before with a nice assortment of workbenches, pie safes and dressers. I have developed a fascination with pie safe tins having noticed that there is an impressive array of tin designs. Almost like snowflakes. Below are pictures of two of the benches. Click here to see the full set on Flickr. Back on a gorgeous Saturday in September, I drove up to Lynchburg, Virginia for a meeting of the local chapter of the MWTCA. After spending time with the area tool enthusiasts, I was drawn to the downtown antiques district. 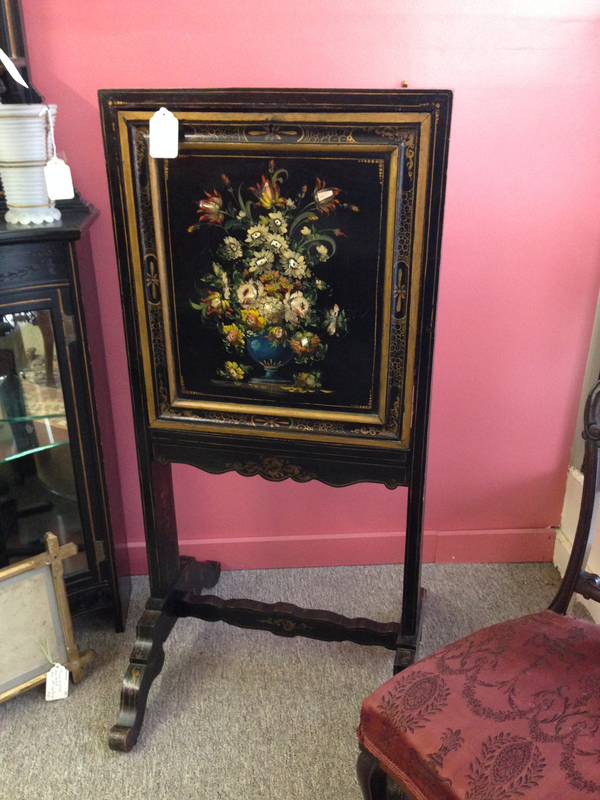 Lots of shops of varying levels from high end antiques to consignment store vintage. Only thing missing was electricity and the lighting that usually accompanies it. Looking at antiques in the dark gives me an appreciation for difficult it was for the colonists to shop for antiques. As I was about to leave, the power came on. My OCD commanded me to go back through the shops again. Much of what I had seen seemed much less old in the light. Things are much more interesting when you use your imagination. Still, lots of genuine antiques worthy of photographing. After exhausting the downtown area, I hit some dealers in the greater Metro area. More picture worthy stuff. One item I liked was a small and unique tool chest. It might be small but it has a lot of interesting detail, dovetails, nearly clocked screws, sliding till and a drawer where you don’t expect one. It also has hardware unlike any hardware I’ve seen before. You can’t buy hardware like this at Lowes Depot. In the afternoon, I rejoined the toolies for a guided tour of Thomas Jefferson’s Poplar Forest. It is Mr. Jefferson’s country home currently undergoing restoration. It was well worth the effort getting there. 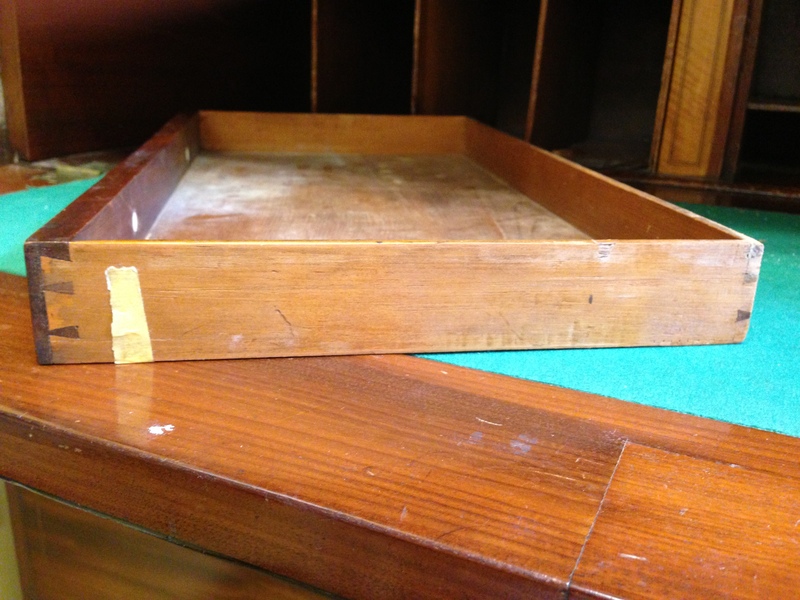 Coming up next, using the color and texture of the Masonite® back to determine the age of antiques. Luan will be covered later.